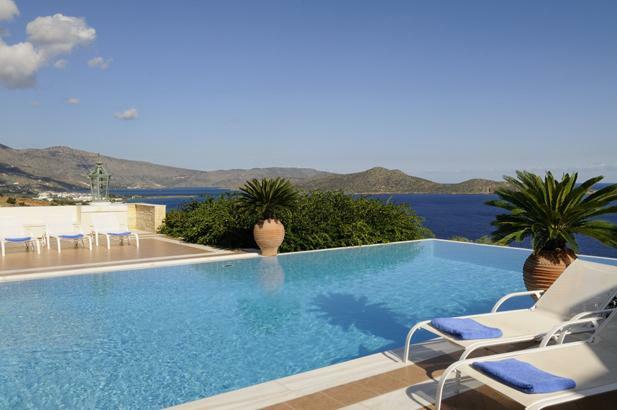 This is one of the finest houses we know and certainly the best one on Crete. 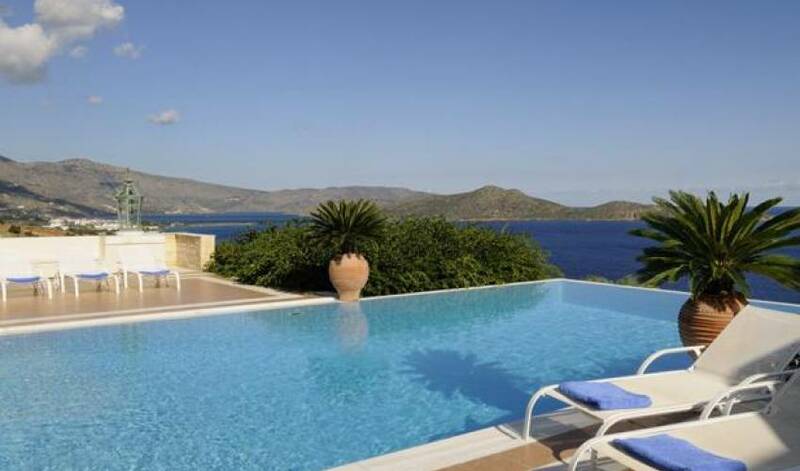 The location is ideal; just a stone’s throw from the village of Elounda on the lovely Bay of Mirabello, an hour from Heraklion and conveniently placed for trips to Aghios Nicholaos, Knossos, Spinalonga and the sights of Eastern Crete. 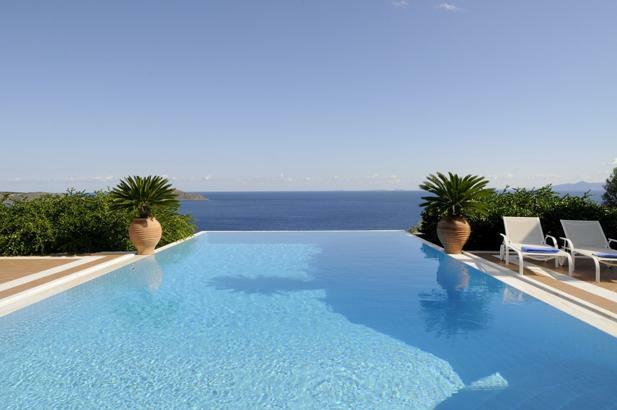 A lovely pool, tennis court, sea platform, guest cottage, chapel and boules court complete the ensemble, to offer the most luxurious villa you can rent on the island. Quiet air-conditioning purrs throughout the house, large French windows and doors fill every room with sunlight at all times of day, bathrooms are substantial marble affairs, bedrooms are immaculately comfortable with A/C and insect screens, and are well appointed, fabrics are fine and well chosen, the owner’s own collection of paintings hang on the walls and their sculptures are dotted around the gardens. Dining can be either down by the pool, on the top terrace, in the elegant dining room or in the wonderful US style kitchen. Further seating areas are dotted around the house and gardens. An Astroturf and sand Davis Cup sized tennis court , a large boules court, a consecrated chapel and guest cottage complete the estate. A large wooden swimming platform has been built by the sea, reached by a gentle footpath ( a 7 minute amble down, rather longer to get back up, but a bench with lovely views has been thoughtfully placed half way up!) 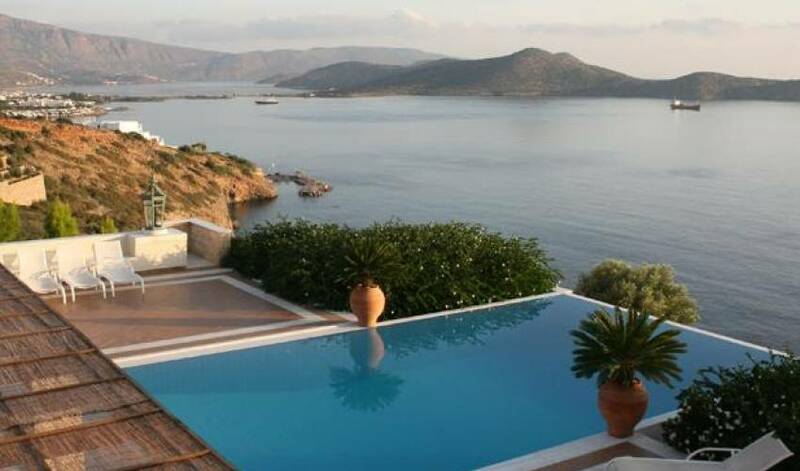 Last but not least, the views... On one side to the sunrise over Elounda and the gulf of Mirabello, to the south and west over the tawny mountains of Sitiea, and straight ahead over the sea, where an orange full moon rises in front of your eyes. “Knossos, perhaps the main reason after the reliably long sunny season why people come to Crete, is about an hour by car, as is Heraklion where the nearest airport is located. Bustling Aghios Nicholaos with its pretty waterfront is about 10 minutes drive away, and various classical sites, Byzantine churches and pretty hill villages are an easy day trip. 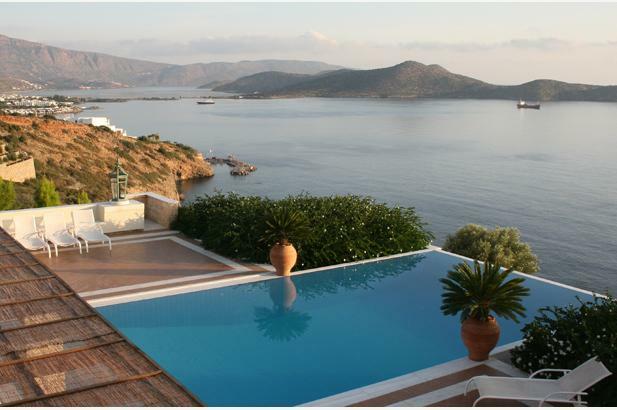 Water sports in Elounda and Plaka are available, boat hire and sailing boat charter are also possible to arrange. 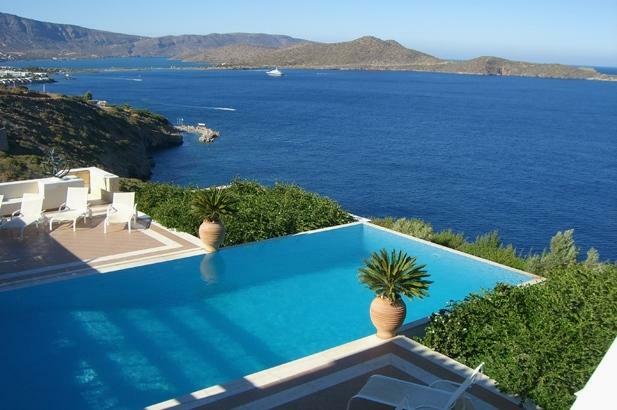 Elounda also offers the usual array of bars, tavernas, shops etc. 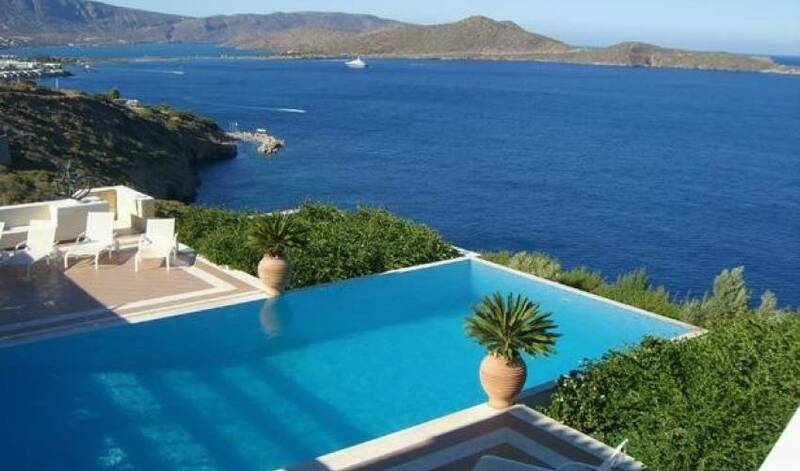 The pool is 12m x 6m which overflows on the sea side. On three sides is a large patio with barbecue and an eating area for 12 people. There is a dumb waiter from the kitchen. There is also a 4m x 5.8m bathroom with changing area and shower. 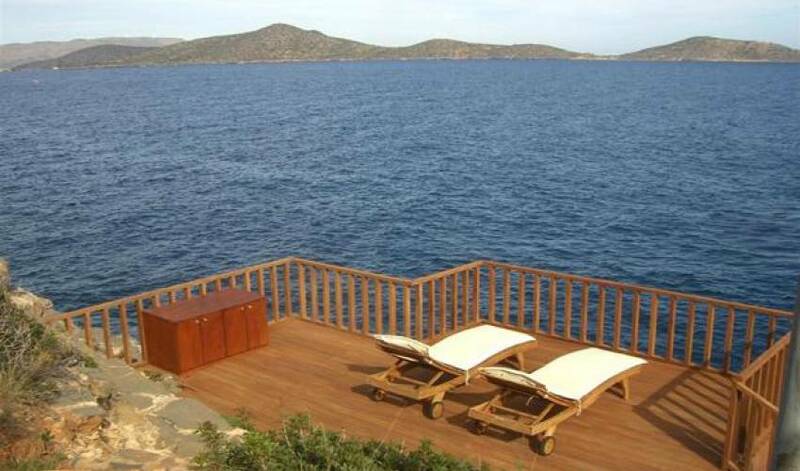 An easy path with occasional steps and a bench to rest on half way down, leads guests for a 7 minute walk down to the sea, where a 4m x 6m wooden swimming platform with two teak loungers with cushions and a safety railing has been built for convenient and private swimming. The grounds include an olive grove with 50 mature trees and a Roman tank protected by Greek laws on antiquities with newly planted grape vines around it. The house is not particularly dangerous for children and the owners have built walls and planted thorny bushes near dangerous drops, but small children should always be supervised both in the garden, around the pool, and in the house. 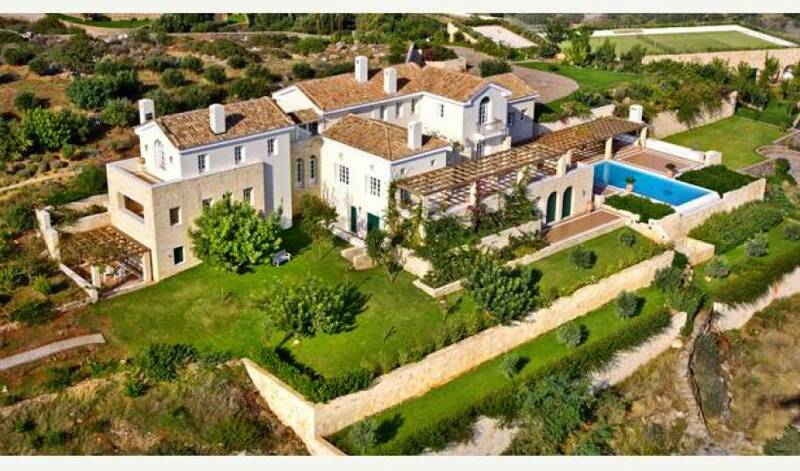 The main house is on a hill with three floors with the lowest floor (Pool level) opening up to the pool terrace and gardens one level below the entrance ground floor. Main bedroom: 5.2 meters square with a king size bed, large porch, fireplace and two en-suite bathrooms - one with a large shower room and the other with a Jacuzzi. Blue Room: 4.7m x 4.1m with a king size bed, en-suite bath and shower and balcony overlooking the swimming pool area with sea views. Moroccan Room: 4.3m x 4m with two twin beds which can be put together for a king size bed, en-suite bath and shower and balcony overlooking the front of the house with mountain views. Front hall on mountain side leading to a 8 x 5 meter double height living room with a 600 year old fireplace, high ceilings and sea views on three sides. 8.6 x 5.2 meter library with a Boston grand piano made by Steinway, broadband wireless internet connection, fax, printer, a large collection of books (classics, best sellers, non-fiction, etc.) and a large balcony with sea and mountain views. 6.5 x 4.7 meter dining room which seats 12. 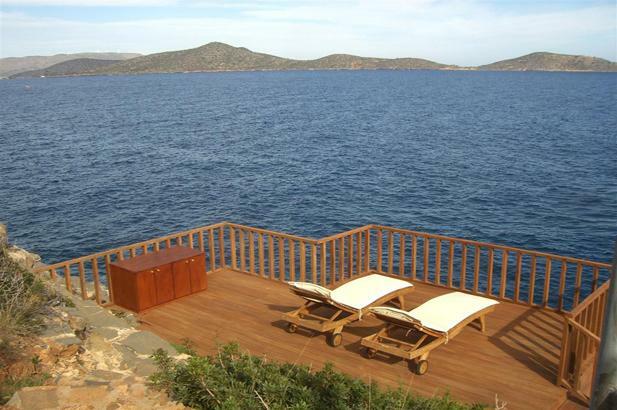 6.6 x 5.6 meter kitchen, fully equipped with a table seating 8 and sea and mountain views on three sides. Outside is a table and four comfortable chairs protected from the morning sun. 5 x 3.4 meter laundry/pantry. Guest W.C near front hall. Between and around the dining room and the living room is a large patio with a marble table seating 12, a pergola and sea views. Gounalakis suite of two bedrooms, each 4.85 x 2.95 meters and each with two twin beds which can be combined to one king size bed. These bedrooms share a 5.75 x 4.25 meter living room and a bathroom with bath and shower. They also lead out to two patios. The Marinos suite of two bedrooms share a small bathroom with shower. One is 5.2 x 3.5 meters with a king size bed, the other is 4.8 x 3 meters with a fold out couch with a particularly good mattress which can be used as a sitting room. The bedrooms lead out to a garden. In addition to various utility rooms and a bathroom, there is a large 11 x 7 meter game room with billiards, satellite TV and DVD player with extensive DVD collection, which leads out to the pool area on one side and its own patio on the other. 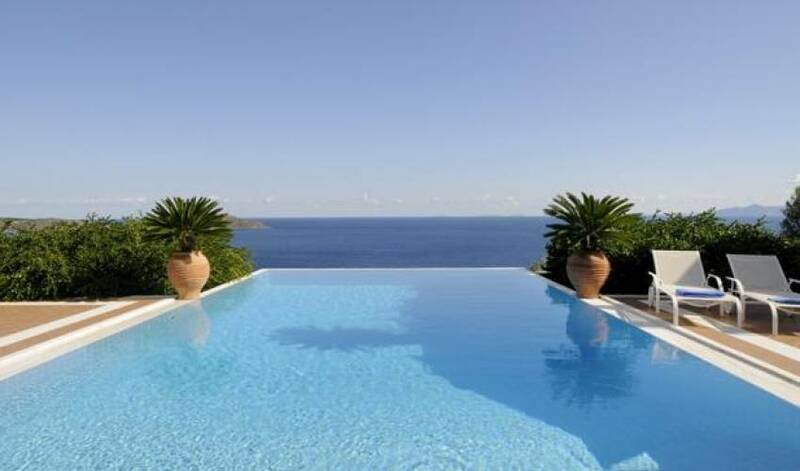 The pool is 12 x 6 meters which overflows on the sea side. On three sides is a large patio with barbecue and an eating area made for 12 people. There is a dumb waiter from the kitchen. There is also a 4 x 5.8 meter bathroom with changing area and shower. Below the tennis court is a charming cottage with two bedrooms (one with Queen size bed and a bathroom en-suite with bath and shower and the other with a twin bed and small bathroom en suite and very small shower). They share an open plan kitchen, dining and living area. This cottage is 65 meters away from the main house, is never rented on its own. A small private Chapel has been used for weddings and christenings. Concierge (five hours) overall management of services and outside bookings. Lunch waiter (three hours) will serve and clean up. Dinner chef (seven hours) a former Relais & Chateau head chef will prepare and clean up. Dinner assistant chef (seven hours) will help preparation and clean up. Dinner waiter (four hours) will serve and clean up. Caretaker (seven hours) will take care of grounds, swimming pool, etc.